Looking at the Lady of the Lake quilt block may make you think that it looks familiar -- and rightly so. 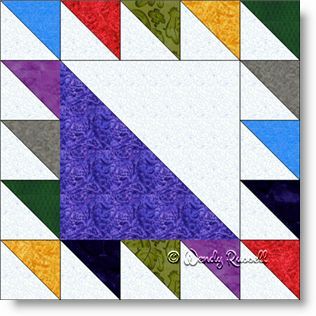 There is a subtle difference between this block and the Opposites Attract quilt block - mainly in the corners. Both of these five patch quilt blocks are fun to work with as you can make so many different looks in your quilts. On the surface the block looks pretty boring, but by switching up the direction of the block and its placement, you can achieve any number of looks. Then, by using up your scrap stash, other possibilities and looks arise. For this quilt block, I have included two pages of quilt layouts -- one page using only two colours and the other page creating scrappy quilts. Now it is your turn to come up with some interesting heirlooms of your own.